Its been awhile since we did an update on Project Ford Fiesta ST Racecar. Until now we have been working on the chassis but now its time to go through the 1.6 liter Ecoboost engine to give it some durability at boost. Although the engine was holding up fine at the stock power levels, we wanted to get more and to do it safely, we contacted the folks at mountune USA for some help with the platform. Our build is mostly focused on helping reliability as we are not going for huge gains in power but what we can do with the stock direct injection system and ECU. We will be replacing the stock turbo with mountune’s performance OEM replacement unit and running more boost so we were worried about the durability of the engine’s internals. Check out the rest of our Fiesta ST build here! mountune’s pistons are made of 4032 high silicone aluminum alloy forgings. The mountune USA forging is much tougher than the stock hypereutectic cast pistons which tend to be brittle. 4032 alloy pistons are not as tough as the more common low silicone 2618 pistons but are still strong. Their main advantage is that they do not expand as much as the 2618 alloy pistons and can thus run a much tighter piston to wall clearance. mountune’s piston has an anti-scuff phosphate-based coating which gives it a dark appearance. 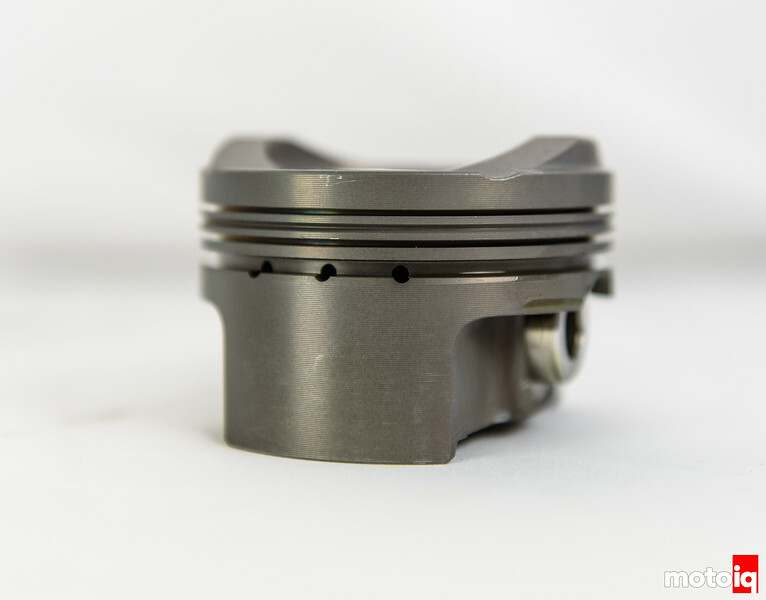 It also has a thick-wall piston pin that will not deflect under the higher loads that the increased cylinder pressure of more boost will give. mountune USA’s piston has a thick ring land for the first compression ring. The lower position of the number one compression ring and the resulting thicker ring land makes for a much stronger piston. Today’s modern emission engines seek to reduce crevice volume to reduce hydrocarbon emissions. Crevice volume is the space from the top of the piston to the top of the first compression ring. The fuel-air mixture that ends up here does not burn and contributes to higher hydrocarbon emissions. 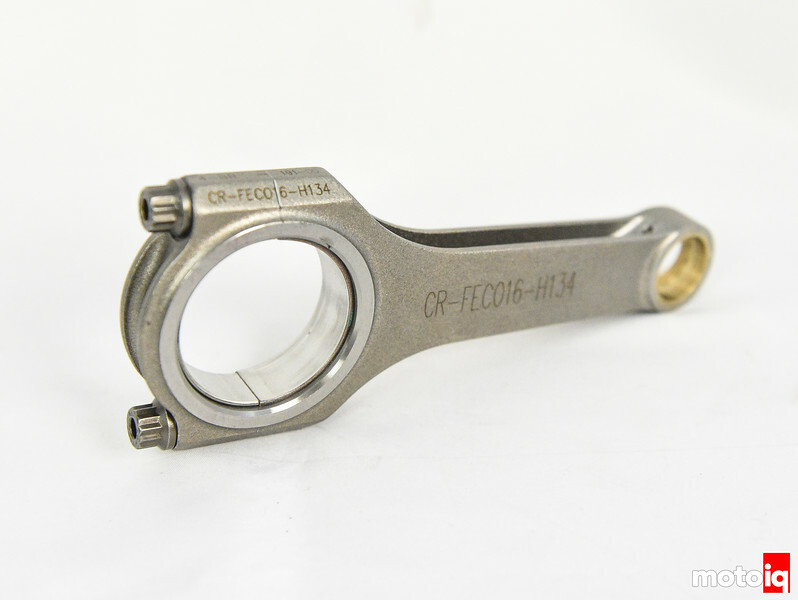 To reduce crevice volume, OEM manufactures move the number one ring up as high as possible on the piston. Unfortunately, this greatly weakens the piston. Higher boost pressure or any sort of detonation ends up bending the ring land down, trapping the ring and causing a loss of compression. Damage to the cylinder walls results as well. The ring land can also fracture and cause the number 2 ring land to break as well. With little thermal mass, the thin ring land can also melt and collapse as well. None of this is good for a turbo engine! Subaru EJ engines have thin top ring lands and are notorious for having them fail. 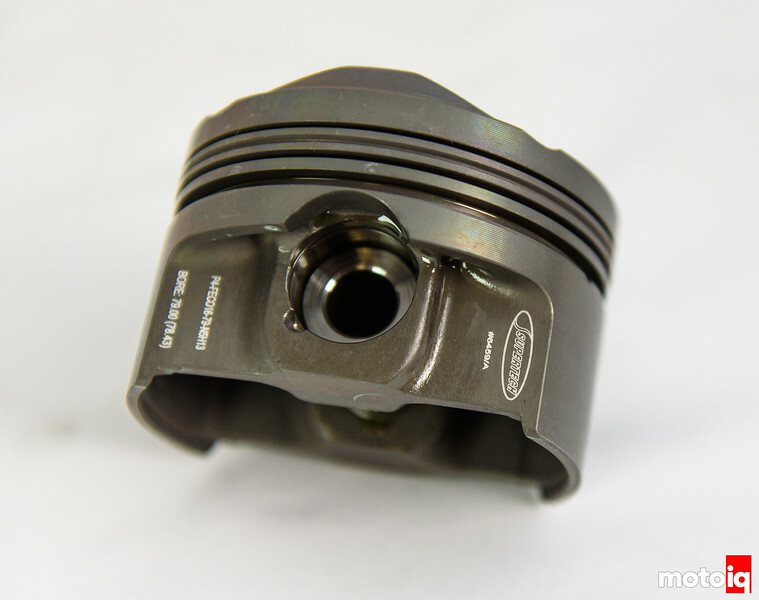 To prevent this the mountune USA piston has a low first ring position for maximum strength. You can see this in the above photograph. This is one piston where ring land failure is very unlikely! The mountune piston has a pressure equalization groove between the two compression rings to help the second ring get a decent amount of pressure behind it for a better seal. The piston also takes thin low tension rings as well as a low tension oil scraper ring.